Sectionals are not created equal. Some are large, some small. Some are fixed while others are modular and can be adjusted to fit just about any room. 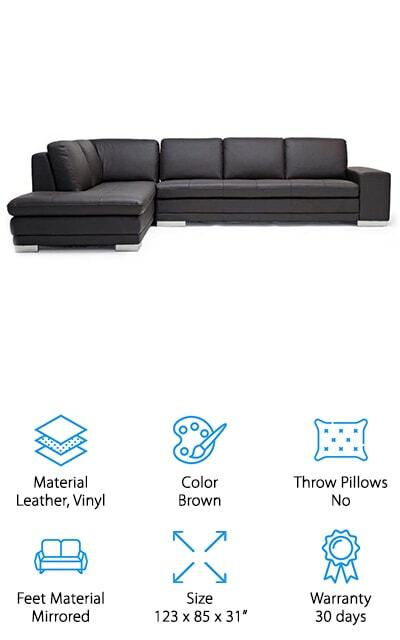 Whether you’re looking for a microfiber sofa or a small leather sectional, the options can be a bit overwhelming. That’s why we researched some of the best products out there and put together this buying guide. Before we move into our favorite products, let’s take a look at some features you should know. Material: We found a lot of different materials, including faux leather, vinyl, polyester, and felt-like fabric, and even denim. In fact, the denim sofa we picked is a great alternative to a blue leather sofa, if that’s what you’re looking for. Color: For the most part, most of these sofas are pretty neutral. You’ll find white, black, and even a brown leather couch. Don’t worry, if you were hoping for a pop of color, we found a few. Throw Pillows: A few of these sectionals include matching throw pillows to make them even more comfortable to lounge on. Generally, they’re made of the same material as the couch itself and are a nice addition to the set. Feet Material: Surprisingly, the feet vary quite a bit! Some of them are wood and some shiny chromed metal. You’ll find a lot of different styles, too. It’s actually a little shocking how much the legs affect the overall look. Size: Sectionals can be tricky because they can sometimes be pretty large. Pay attention to the dimensions, especially if you have a small space. Yes, some of these can be set up facing right or left but that won’t change the size. Warranty: Most of these warranties are pretty short and sit around one year or less. The best one we found is for ten years. Remember, make sure you read your warranty so you know what’s covered, just in case. Now that you know what to look for, let’s take a look at our reviews. Whether you’re taking your time looking for a grey leather sectional, a microfiber sectional, or you’re in a hurry, the top of the list it the best place to start. Our top and budget picks are listed first to give you a good idea of the range that’s available. These sectionals are all so different, check out as many as you can. Okay, are you ready? Let’s go! Our top pick is this gorgeous brown leather sectional from Baxton Studio, the Callidora Sectional. It has a sturdy hardwood frame covered in polyurethane foam cushioning that’s both supportive and comfortable. The visible portions of the seat and back cushions are covered in soft brown leather while the rest of the piece is covered in closely matching vinyl. It seats four comfortably but could easily provide seating for up to six people if needed. All of the cushions are fully attached and non-removable which helps keep them in place and prevent uneven wear. That’s not all, mirror sided feet add both a different texture and a shiny detail that really catches the eye. One more thing, this sectional is comprised of a straight piece and a left facing chaise. Our budget pick isn’t just a blue sectional sofa. 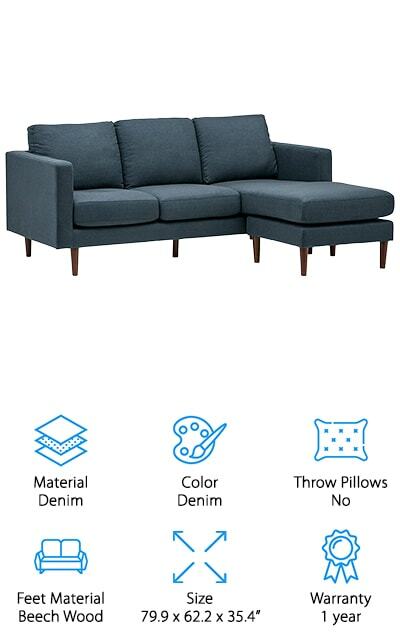 The Revolve Sectional by Rivet is actually upholstered in what looks like denim. The material is really durable and easy to clean, all you have to do is gently wipe it with a cloth. This is a great sectional if you don’t have a lot have space. It gives you extra seating without taking up most of the room like larger sectionals do. Plus, it includes a chaise section that can be moved to either end so it can accommodate the layout of your room. This sectional has a sturdy hardwood frame and solid beech wood legs. Assembly is simple, just screw in the legs and you’re ready to go. It includes free returns for 30 days and a 1-year warranty. If you’re looking for a modern sectional that’s, well, huge, check out the Modway Empress Sectional. This mid-century modern design is upholstered in quality polyester material. The color is a deep, saturated teal that will definitely be the focal point of your living room. The design features tufted button back pillows that really give this couch a contemporary look with a bit of a retro feel. This piece comes in three sections, a corner section with a sofa section on either side. In addition to looking awesome, it’s built really well, too. This sectional has tapered solid wood legs that come with plastic glides so as not to scratch your floor. It’s comfortable, too, with plush cushions that are 6-inches thick. And get this: it can hold up to 1320 pounds! 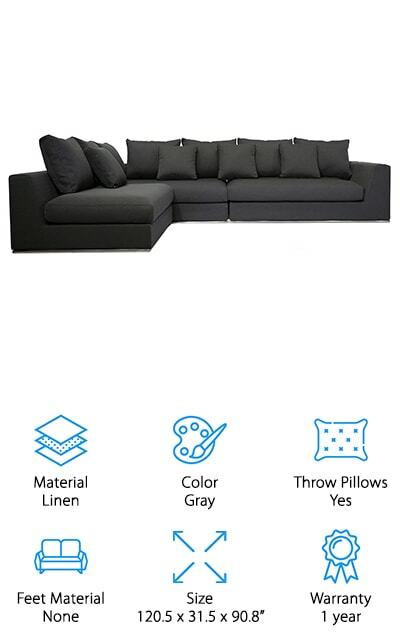 This large gray contemporary sofa sectional from UrbanMod has a really interesting design. The frame is solid wood but it’s lined with stainless steel which adds a little shine and a bit of an industrial feel. But don’t worry, this sofa still has a warm, plush feel. The cushions have clean lines and tailoring and are extremely comfortable. It’s covered in soft gray fabric and comes with four soft pillows. The cushions contain sturdy Velcro taping to keep them in place while still allowing you to remove them for cleaning. That’s not all, the fabric is actually removable and can be dry cleaned to keep it looking clean and new (although it’s stain resistant and shouldn’t require much cleaning). Plus, you can arrange this L-shaped sectional multiple ways to accommodate any room. When it comes to modern sectional sofas, the FDW Modern Sectional is one of the most unique designs we came across in our research. The cushions are filled with firm padding and covered in black leather. The welting is crisply tailored and both moisture and stain resistant. It’s really easy to clean because you can just wipe away any mess. This is an L-shaped sofa with a chaise. The chase sits on the left side though you can mix and match it in various configurations to suit your living room space. It includes two matching accent pillows that allow you to get even more comfortable. Plus, the legs have a shiny metal finish while the ottoman has small casters that make it easy to move it from side to side. The UrbanFurnishing Sectional stands out among home furnishings thanks to its modular design. This low profile sofa is extra wide and deep. It’s really comfortable and gives you and your family a lot of room to move around. The light gray modern felt fabric is plush and cozy with a wide profile with lots of room to get comfy. As for the cushions, they’re filled with multi-layer foam that gives long lasting support. Plus, the anti-sag design keeps them in good shape for years to come. This is a six piece modular set that includes four middle pieces and 2 corner pieces that can be laid out in various configurations. And get this, if you ever want to add more pieces for an even larger piece, you can add to it by purchasing additional modular pieces. 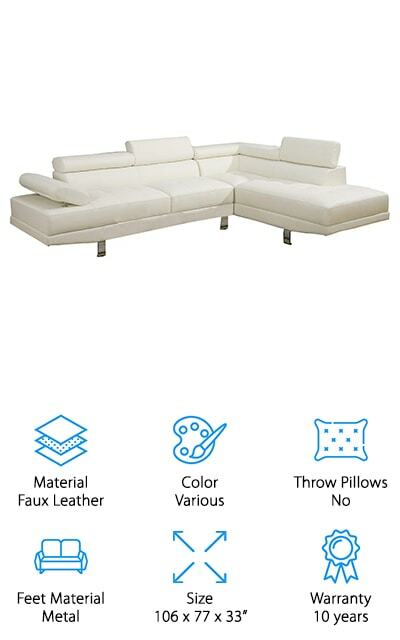 When it comes to white leather sectional, this one from Divano Roma is one of the best. It’s covered in bonded leather which gives the rich, leather look while also adding additional durability. This is a great piece for small spaces, too, as it’s about the size of a regular sofa but with an extended chaise that can be moved to the left or right side to fit the layout of your room. 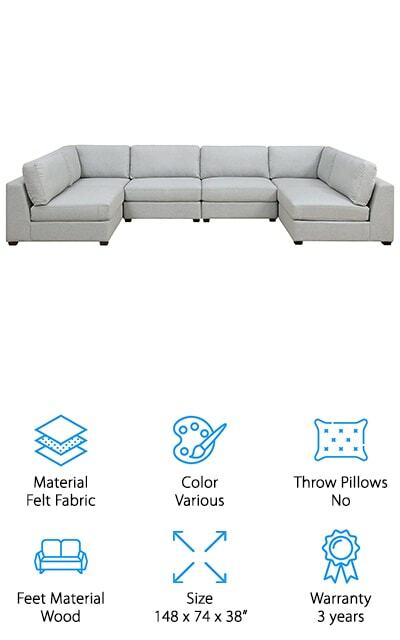 Assembly is quick and easy, all you have to do is screw the legs on and you’re ready to enjoy your new sectional. Speaking of the legs, they have a chrome finish that adds a bit of shine to this design. There’s more, the cushions are filled with comfort foam that is really comfortable and provides support over extended periods of use. If you’re looking for larger sectional upholstered in white leather, take a look at the Casa Andrea Milano Sofa. 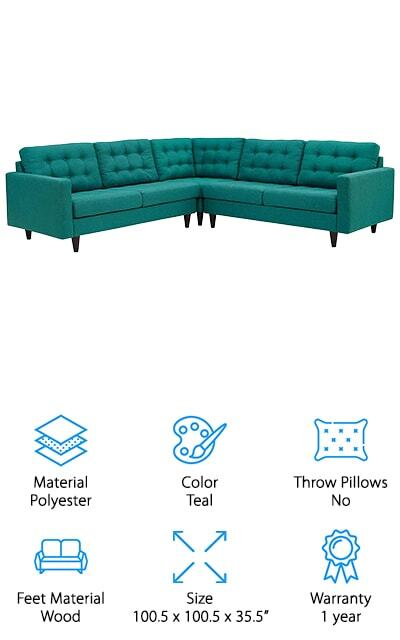 This is a two piece sectional that includes several adjustable armrests and back supports. That means you can adjust until you find the perfect fit for you. 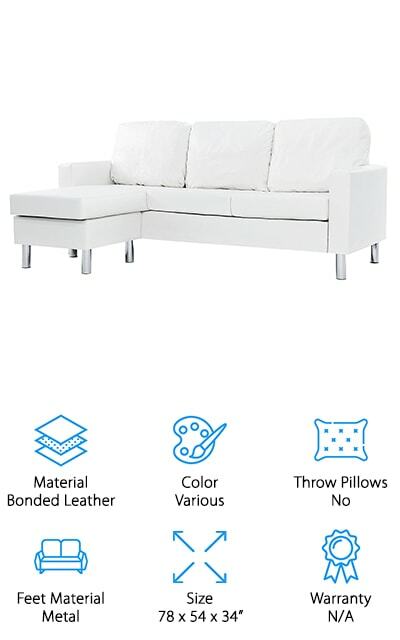 This sofa has an ultra modern look with clean lines and sharp angles. The wooden frame is strong and durable and it’s available with white or black faux leather upholstery. For some interesting detail and a little bit of shine, the legs have a silver metallic finish. And get this, it’s so well made that it includes a ten year warranty, the longest warranty coverage of all the products we researched. Assembly is really easy and all of the tools you need are included. Last up in our list is the Dorris Sofa from Container Direct. This two-piece design has a right-facing chaise. It’s constructed with a solid wood frame. The legs are rectangular in shape and made of chrome-plated metal which adds a bit of shine and a very modern feel. It comes in two different colors, medium gray and beige, both of which are neutral enough to fit into just about any decor. This fabric has a bit of a linen-like look to it. The clean lines are accented with beautiful button tufted back cushions. They really add some interesting elements to this otherwise streamlined and linear design. That’s not all, this sectional is a nice size but won’t overwhelm the room. It seats three or four people comfortably. 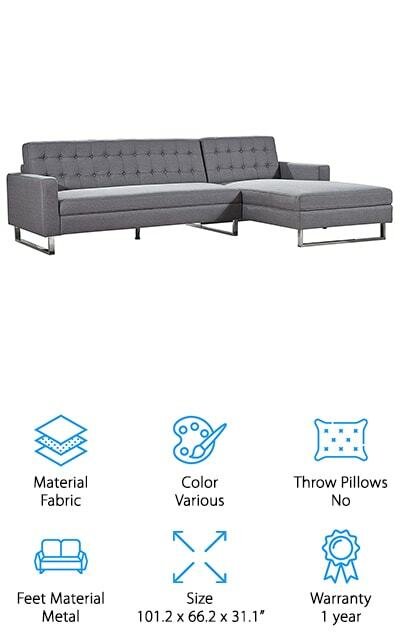 Our next modern sectional sofa is the Poundex Bobkona Sectional. The clean, straight lines of this design are accented with button tufted back cushions and rounded armrests and edges. It’s upholstered in gray polyester fabric that has a linen-like look and feel. It’s elevated with angled peg legs that add a bit of a futuristic twist. This sofa is also really comfortable. The cushions are filled with foam and innerspring which means they have long lasting durability and exceptional comfort. That’s not all, there’s even an interlocking insert that helps keep all the pieces together. Assembly is easy, the solid wood legs twist right on. All of the other tools you need are included, too. 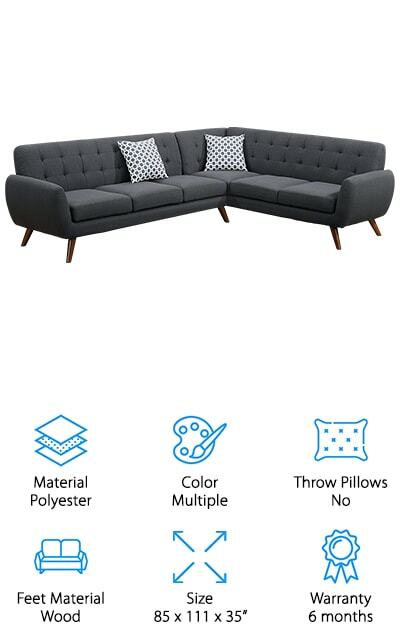 One last thing, this L-shaped sectional is designed with the longer side on the left.